The acting head of Egypt's Coptic Orthodox Church has released details of the 17 candidates in the running to become the next pope, according to a report on Ahram's Arabic-language news website. Bishop Pachomios has been head of the Coptic Orthodox Church of Alexandria since the death of Pope Shenouda III in March. The election of the next pope is due to take place in autumn. Seven of the candidates named by the Church are bishops and 10 are monks. According to church rules, the list will be whittled down from 17 to 7 from which the boards of the church's city councils will vote to pick three. The final choice will be made by a young child picking a name from a box. Born in 1942, Pishoy studied engineering before joining the monastic order. Ordained as a Bishop in 1972, he was elevated to the rank of Metropolitan in 1990. A former student of medicine at the University of Assiut, Youannes was ordained as a Bishop in June 1993. Born in Sharqiya governorate in 1949, he has a degree in agricultural sciences and was ordained as a bishop in June 1985. Born in 1952, he studied pharmacy at the University of Alexandria and was ordained in June 1997. Tawadros is a member of the Holy Synod. 5. Bishop Raphael: Auxiliary Bishop of Central Cairo and Heliopolis as well a former aide to late Pope Shenouda III and member of the Holy Synod. Born in Cairo in 1954 and a graduate from Ain Shams University's medical faculty, Raphael was ordained as a bishop in June 1997. Born in Cairo in 1948 and a member of the Holy Synod, this medical graduate was ordained as a bishop in June 1976. Born in 1952 in Sohag governorate and a former engineering graduate, he was ordained in June 1986 before becoming Bishop of Milan in June 1996. A monk at the monastery of St. Samuel in Minya governorate. Born in 1939, he has a degree in commerce. Born in Alexandria in 1954, he serves at the monastery of St. Anthony in the Red Sea governorate. Holding a degree in agriculture, he also has a diploma in icon restoration from the University of Moscow as well as one in museum administration from the United States. A monk at the monastery of St. Mina (Mar Mina) in Alexandria, he was born in 1924 in Cairo and graduated in law from the University of Ain Shams. A monk at the monastery of St. Pishoy in Wadi Natrun, he was born in 1951 and has a degree in mechanical engineering. Also serving at St. Pishoy in Wadi Natrun, Shenouda was born in 1943 in Minya and holds a degree in religious studies. A monk at the monastery of St. Paul in Egypt's Red Sea governorate, he was born in 1964 in Mansoura. He holds a degree in agriculture from the University of Alexandria. 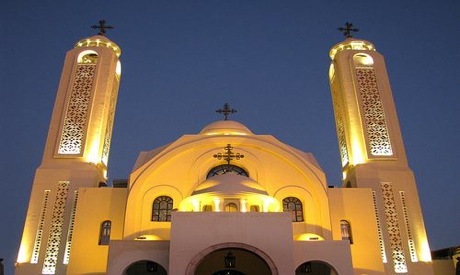 Also at St. Paul's, Sawiros was born in Sharqiya governorate in 1959 and has a degree in religious studies. A monk at the monastery of Virgin Mary in Wadi Natrun. Father Pachomios was born in Aswan in 1963 and has a joint-degree in science and education. Also at the monastery of Virgin Mary, he was born in Qena governorate in 1962 and holds degrees in science, education and Coptic studies from the University of Lyon. The third contender from the Virgin Mary monastery, he was born in 1959 in Cairo and has a science degree from the University of Ain Shams. which one is known as Peter the Roman ? Man look at the eyes while GOD look at the heart. We just beg him to announce his great will. I just hope some of them has a deeper understanding of what the Church really is! Only two have finished something translated as 'religious studies'. A head of the Church needs to have theological education.